Little pieces of mee: A little healthy treat - chocolate tarts! 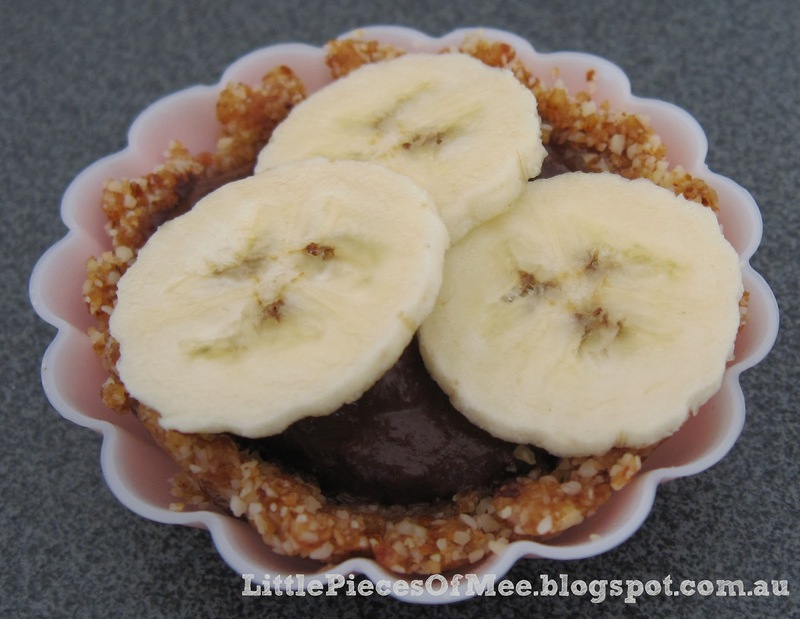 A little healthy treat - chocolate tarts! Hello again! By request of my lovely mothers group friends, I am sharing with you a recipe for a healthy chocolate tart. Its made with no sugar, no dairy, and no wheat/gluten, so you can indulge in this one without feeling guilty! Now I don't usually make things like this but it was my turn to host mothers group this week and one of my mums group friends is currently on a dairy/gluten/sugar free detox. I had originally decided just to have lots of fruit, rice crackers and carrot and celery for us all to munch on, but when I came across this recipe in the current (May 2013) Super Food Ideas magazine on Monday as I was preparing my meal list and shopping list for the week, it was like it was meant to be. The recipe is from the new 4 Ingredients Gluten Free Lactose Free book, so its easy to make and only needs a few ingredients. The whole tart actually uses two recipes (one for the base and one for the filling). When I prepared it last night and had a taste test of the filling, I was a bit disappointed with the flavour. My bananas were still a bit too green so you got a bit of a bitter taste coming through, and with the bitterness of the cacao powder it was a bit too strong. I ended up adding some extra maple syrup to give a bit more sweetness but it was still a strong flavour. However, when I tried it with the base as well the flavours were a bit more balanced. I had hoped to serve a really yummy treat for my guests but I just decided to put a "healthy" disclaimer on it when I served it and hoped that they didn't spit it out. To my surprise, when I tasted it again this morning, it tasted absolutely amazing! Overnight, the bitterness had disappeared and the chocolate filling was now delicious, sweet and smooth, and it feels and tastes like a very decadent, unhealthy chocolate tart that you might find in a specialty patisserie. I added some slices of banana on the top which gave it a bit more sweetness - you could also use strawberries, raspberries or other fruits. 1. Place ingredients into food processor and blend for 5 minutes or until quite fine and mixture starts to come together (you may need to stop and use a spatula to scrape the mixture down onto the blades). 2. Divide the mixture between 4 x 11cm-round (base) loose-based, fluted flan tins. Press it into the corners of the base and sides and chill for at least 1 hour before filling. Fill with chocolate mousse (recipe below). 1. Scoop the flesh of the avocados into a food processor, add the banana, cacao and maple syrup and blend until smooth. Pipe or spoon into glasses (or cheesecake base from above recipe) and refrigerate until set. Little pieces of mee notes: I used small silicone tart cases and the base mixture made 12 tarts plus there was still some left over so I made two extra large ones in some big ramekins. I also added extra maple syrup to the mousse but if the banana was a bit sweeter I probably wouldn't have needed the extra syrup. I made the tarts the night before and refrigerated overnight. Top your tarts with sliced banana, strawberries or other fruits as desired just prior to serving. Raw cacao powder is available from health food shops.